The TRU8885-2 from Uniden is a cordless phone with a built-in answering machine, caller ID compatibility, and expandability to 10 handsets. It comes with two handsets, one that recharges in the base unit and another that recharges in the included remote charging cradle. That latter requires only an AC outlet, so you don't have to worry about additional phone jacks. By utilizing the less cluttered 5.8 GHz frequency, the TRU8885-2 is able to offer a clearer, more intelligible signal than older phones operating on lower bands. 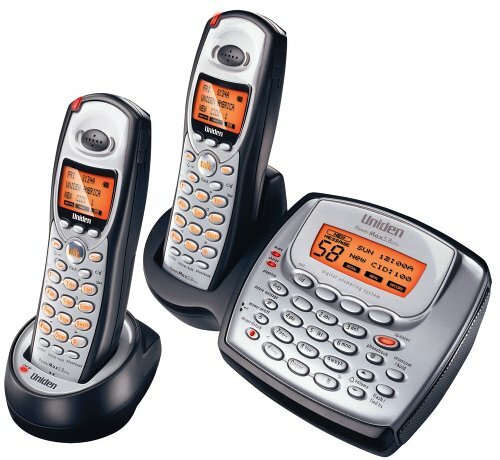 Caller ID/call waiting compatible (requires subscription through your local phone company), the TRU8885-2 holds up to 200 numbers in its internal caller ID/phone directory (100 on the base, 100 on the handset), while the display-and-dial feature allows you to quickly scroll through the caller ID list and dial the displayed number with the touch of a button. Ten speed dial presets allow you to easily call the most frequently used outgoing numbers, and an alphabetical search feature provides an easy way to locate numbers stored in the internal memory. Handset and base speakerphones provide a hands-free communication method, while a direct link mode allows you to use the handsets as walkie-talkies. Four-way conferencing allows several phones to communicate with an outside call. An intercom function enables communication with other phones on the same system, and the call transfer feature lets you transfer calls from the base phone to the handset and vise versa. The all-digital answering machine has a 12-minute maximum record time and a four-minute maximum message length. A conversation record feature provides a quick and easy way to save important information such as directions, while full remote operation allows you to check your messages even when you are away from home. A page/handset locater feature makes finding a lost handset quick and painless. Handset and ringer controls let you adjust volume levels to your liking, while the redial button automatically calls the last three outgoing numbers. The TRU8885-2 also comes with a one-year limited warranty. I've been wanting to get a 5.8ghz phone system for a while, but all previous models seemed to always have some kind of major shortcoming. Seems Uniden recognized this and came out with a model to beat all previous ones. The 8885 and 8865 models are newer versions of their old 5860/85 lines. It has pretty much any feature you could want. 1. Nice phone design. Perfect size and not as ugly as the previous model. 2. Perfect reception. Anywhere in our house the phone is crystal clear. 3. Speakerphone in the base and from every handset. 5. 100 number phonebook (although it shares entries with callerid). You can keep separate phonebooks per phone, or download the phonebook from other phones. 6. DirectLink mode, where you can use the handsets as walkie-talkies. Although in my opinion the phones are a tad too big to carry around with you everywhere, but it might be nice for specific situations. I haven't tested the range though. 7. You can have the base + 2 handsets speaking on the line at the same time. The previous model was limited to 1 handset per conversation. 8. Customizable ringtones - can assign a certain ringtone to a certain caller so you know who they are. Can only use the builtin tones though. 10. Can access the voicemail from any of the handsets, not just from the base. Those are just some of the major features, there's plenty of other little bells and whistles to configure the phone. My only 2 complaint is that incoming caller ID gets stored on every phone. There is no way to just delete it from all phones at once. You need to go to each phone individually to delete the callerid list. Fortunately there is a delete all option. One other potential complaint is that you can't set up separate mailboxes on the answering machine. I know some of the other brands let you do this. No biggee for me as I wouldn't use the feature anyways, but might be important to some. Those might just be nitpicks though. This system really exceeded my expectations and I give it the highest recommendation possible. 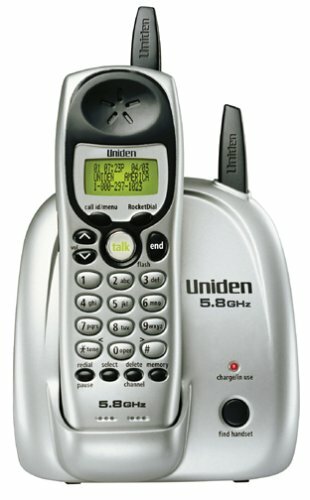 After going through cheap cordless phones faster than a pair of sneakers, I decided to part with some extra money for the Uniden TRU-8885-2. I was floored by the features: big bright backlit displays, crystal-clear sound (both earpiece and speaker-phone), synchronized handsets (day of week/time, phonebooks, conferencing), sophisticated but easy to use menus, as well as access to the same features from all handset menus. However, a little extra money also gets you good, solid construction. Both handsets and base have solid buttons that are easy to push yet are rigid and don't feel like they could fall out or misfire. The handsets are compact and contoured for your hand. The internal antennas add to their aesthetics. During calls, features are easy to access with a single click, like volume up and down buttons, mute, and speaker-phone (if you need to put the phone down and continue the call). The selection of ring tones and tunes are actually pleasant and far less cheesy than the ones in my Nokia cell phone. Only drawbacks noticed so far could be some sporadic reception issues depending what kind of structures are between you and the base. I can get great reception in one distant room, but not another. This could be the case with any phone, and with the newer 5.8 GHz band (and shorter wavelengths), articles suggest there may be a very slight trade-off with reception for the extra security. Nevertheless, it appears that a little common sense and strategic placement of the base could work wonders for any reception problems. I've also noticed that the answering machine seems to be a little dodgy in detecting early hang-ups; they tend to result in the "please hang up and try your call again" messages. But if you limit your incoming messages to 1 minute (and not four) then this problem should be kept under control. I otherwise love the answering machine set-up and operation. This is a handsome, well-built, and feature-packed phone that, at least in homes and apartments less than "sprawling", should offer good reception and performance. Finally, the "true" 5.8 GHz receive/transmit was a must as I am a wireless network user. no power failure issues for messages? I would have to say though that the answering machine is a little hard to get used, especially when my old Siemens 4215 had such a nice interface (it said the caller id and time when listening remotely and showed caller id on the display when accessing through the handsets. It seems especially odd that the Uniden says the time of the call after you play the message rather than before! The Uniden voice is also a lot more "robot-like" than the old Siemens. "The range of the phone will depend on your environment for both using the handset and also in direct link mode. With out any interference and a direct line from the base to the handset, the range is up to 6000ft. In direct link mode the range is line of sight between the handsets. If there is a power failure, the messages will be restored regardless of how long the power was out." Went from a Panasonic 900 mhz to this phone mainly for the capability to expand to many rooms w/o having to wire new jacks. Others have a fine job in their reviews, so just want to comment on what other see as a flaw but I see as a positive which is the Caller ID delete functionality being independent on each phone and the base unit. Some have said all should be able to be deleted at once--a "universal" delete. We have three users on the phone line each with their own handset. The way it works now, each of us can determine for own handsets which ones to delete--if Uniden ever goes to the universal delete, I hope they give the option to let the "deleter" choose which handsets (or the base unit) to do the "univeral" delete. Does this phone sound good??? I bought this phone twice, AND returned it twice. I read so many glowing reviews I thought maybe my first Uniden was just defective. This phone does have great features, it's pretty, and kind of fun. BUT the range is beyond HORRIBLE! It's a joke. I live in a small house..if I go to the end of my home...all of 45 feet..this phone breaks up badly. I can't even use it in my basement directly below the base. What is the puropse of a cordless phone...if you can't walk more than 40 or so feet from the base? Also yes the receiver end does sound rather good. But just leave yourself a voice mail if you have voice mail at work etc. You'll find that this Uniden does not sound good to others. The speech transmit sound is very dark, and almost muffled. I had many complaints that I sounded as if I were on a bad cell phone. Also you will hear YOUR voice in the earpiece...which is good. But it sounds slightly buzzy and borderline distorted. It gets annoying after a while. 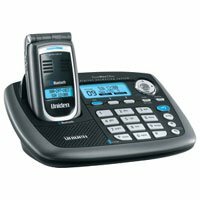 The Uniden TRU8866 cordless phone system offers an attractive bundle of features with room to grow. 5.8 GHz digital signal transmission offers increased call clarity and security while the impressive caller ID capabilities ensure that you'll never miss a call or lose an important number. Plus, a duplex speakerphone in the base and a standard speakerphone in the handset provide hands-free conversation options. Housed in a professional-looking, no-nonsense black case, the phone's memory is shared between the caller ID log and the programmable memory dialing--100 names and numbers in the handset, and 100 more in the base unit. You can locate numbers using a alphabetic search tool similar to that of a typical cell phone, and the most commonly dialed numbers can be assigned to 10 speed dial presets accessed on the base unit. The TRU8866 offers room to grow. It's expandable to 10 handsets (model #TCX860, one included). With additional handsets, you can transfer calls, transfer memory locations, and even use them as an intercom around the house or as a room monitoring system (baby monitor). Additional features include conferencing, trilingual menu display options, distinctive ring tones, mute, hold, redial, and headset compatibility (headset sold separately). Even with additional handsets, the TRU8866 requires just one phone jack. Simply plug the base unit into a phone jack, and the additional handsets will configure themselves to "talk" directly with the base unit. 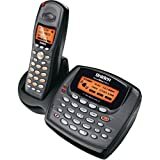 The Uniden TCX860 is a supplemental handset for use with Uniden's TRU8800-series expandable phone systems, particularly the TRU8866 because of its solid black color. (Most models in the TRU8800-series are black and silver rather than solid black. The black and silver supplemental handset is Uniden model TCX800.) It supports the same handset features found on your existing TRU8800-series system and operates on the same 5.8 GHz digital signal for clear calls and increased security. The TCX860 does not require a phone jack for operation. It automatically configures itself to "talk" directly with your phone system's base unit. Each system offers a different specification on expandability and features, so be sure to check your system to see how many handsets you should order. Handset features include caller ID/call waiting, speakerphone, conferencing, call transfer between handsets, four-line backlit LCD, tri-lingual display options, illuminated keypad, walkie-talkie capability, room monitoring, and distinctive ring tones. The TRU8865-2 from Uniden is a 5.8 GHz phone system with plenty of features, including a second handset and charging cradle and the option to add even more. 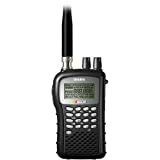 By utilizing the 5.8 GHz frequency with digital transmission, the TRU8865-2 is able to offer a clearer signal and greater distance than traditional phones operating on lower analog bands. Multi-user expandable, the TRU8865-2 supports up to 10 handsets on the same system, allowing you to place extra handsets wherever you need them. Caller ID and call waiting compatible, the base unit holds up to 100 caller ID/memory locations in its internal memory, while each handset stores up to 50 locations, so you can keep track of incoming calls and store the most important phone numbers for easy recall. Handsets can be used in DirectLink (walkie-talkie) mode to communicate with other handsets on the system, while a baby monitoring mode lets you hear what's going on at another handset location. Handset and ringer controls allow you to adjust volume levels to your liking, while an illuminated keypad makes dialing in poorly lit areas a snap. A page button makes finding a lost handset a breeze, and four-way conferencing lets you speak to multiple parties at once. Handset and base speakerphones allow you to communicate hands-free, while a call transfer function provides a way to route incoming calls to another handset. The base unit is wall-mountable for added convenience, and each handset is headset compatible and comes with a belt clip. The TRU8865-2 also comes backed with a one-year limited warranty. As others have noted, this phone system has an amazingly useful set of features. I'm replacing a very expensive Siemens system that has served me well for nearly 10 years, and it's taken that long to find a suitable replacement (which had to be 5.8MHz to avoid interference with LANs and other 2.4GHz devices I need to use). One correction of a criticism in prior reviews -- One user noted that the numbers saved in Caller ID can't be dialed as saved. In fact, the phone will insert or remove the leading 1- for long-distance dialing just by pressing the "*/Tone/<" key, and it will insert or remove the area code by pressing the "#/>" key. This is handy, and it's too bad the annoyed reviewer didn't notice it in the manual (p. 53). Transferring ALL numbers in the phone directory from one unit to another (base or remote) is absolutely essential if you're using it as a home phone, and I was relieved to confirm that it does this. 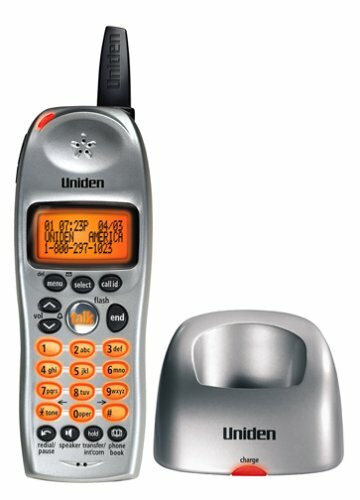 Unlike my excellent Siemens, the Uniden lets any remote perform call screening, so you can listen to incoming messages and pick up the call without sprinting (no pun intended) for the base unit. I have not yet tested the transmission range. Hopefully it's at least a few hundred feet... The higher radio frequency (5.8GHz) means it's a bit more directional (line of sight) than the older phones. In any case, it works very well within my house, with no evidence of powerline or other interference. The sound quality is much better than average. Having each handset operate as a small speakerphone is also a big plus, especially when reviewing voicemail. I'm delighted to have a small red LED on each handset to indicate when there are unread messages. With 5 handsets in my house, it's very useful to NOT have to connect to the base to check if there are new messages. You can disable this LED, or go a step further and have the handsets/base beep every 15 seconds as well. Another thoughtful voicemail feature -- if you try to delete all messages, it won't do so if any of them are still unread. The phone fully supports the new Call Waiting Deluxe features offered by some phone companies -- you get to choose what happens to an incoming call while you're on another call. Room monitoring is better than on the Siemans -- you can choose which handset (or base) does the monitoring, and which does the receiving. Monitoring and answer machine call screening can both be turned off if you don't want these features to be used. The ring tones include a very subdued "Soft Alert" tone, which is perfect for the bedroom. A good collection of tones and tunes is also provided. You can assign any ring tone to any number in the directory; this will be used as a distinctive ring whenever an assigned phone number (with caller ID) calls you. DO NOT EVEN TRY THIS PICESE OF SH-T! YOU WILL BE VERY SORRY. GOOD LUCK IF YOU DECIDED TO BUY IT. I have had this phone for 2 weeks now glad we bought it. I have not had any problems with the phone regarding clarity, ease of use, or interference. The only complaint I have is that the custom ringer feature only works when you store the caller ID exactly as it appears when the person calls, which makes it difficult to recall later in the phone book. I purchased the model with three handheld receivers and I am ready to buy more. The phone not only sounds great it sounds great to the person you are talking to. My computers 2.4 wireless LAN system was very sensitive to my other 2.4 GHz phone. It would cause no end to my network problems. 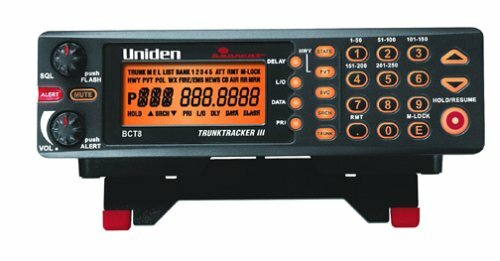 When I purchased the Uniden 5.8 system, my problems stopped. The phone has excellent range and can be used like walkie-talkies to talk with your family or coworkers. Add to that the hundred number memories with answering machine and the best system ever is born. Another nice feature is that I know of no 5.8 GHz scanners that can listen to my calls. I can add up to ten handsets and the answering system base can be used to call from with the speakerphone option. That means you can have eleven phones in your house or office that need no wire except the base unit. I have an all-metal shop that the phone works perfect in. All in all the phone works a thousand percent better than the 2.4 GHz phone that was causing all the problems with my wireless network. The final note is this phone system is necessary buy if you want the best performance with any wireless system. I can give my highest recommendation to this phone system and my family and I are enjoying it. Great phone from the perspective of features and clarity, ergonomics. The only gripe is that the range is kind of pathetic. I had a 2.4GHz Panasonic before this one that beat its pants off for range. Might have something to do with the fact that it has no antenna on the phone or the base unit. Do these guys test their stuff? I thought 5.8 would actually have better range. 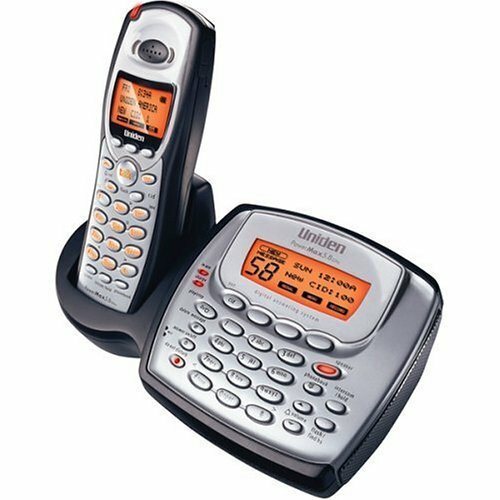 The Uniden TRU8860-2 cordless phone system offers an attractive bundle of features, with room to grow. With 5.8 GHz digital signal transmission for increased call clarity and security, it also stores up to 100 calls in its caller ID log, includes handset speakerphone and conferencing capabilities, and can be expanded to 10 handsets. The caller ID log shares space with a programmable memory and is accessed via the handset's three-line backlit LCD. It also features a thoughtful alphabetical search option (just like a cell phone), so you don't have to scroll from A-Z, and you can transfer stored numbers from one handset to another. Additional features include call transfer between handsets, distinctive ring tones, household intercom, and even remote room monitoring (baby monitor). The TRU8860-2 requires just one phone jack, no matter how many handsets you add. Simply plug the base unit into a phone jack, and the additional handsets will configure themselves to "talk" directly with the base unit. No doubt, this phone has lot of features. I was waiting for this phone to come since Feb. Its photos and all look very pretty. But, when I went to see this phone physically in a store, I was really repelled by the cheap quality material used. This phone really looks like a kid's toy and that too from some one dollar shop. Needs lot of improvements in the design, aesthetics and material. I was all hyped up about getting this phone and that feeling faded after only 24hrs of owning it. This phone represents a good try by Uniden, but I feel that it needs to go back for a version 2. First, for me, the ringers on this phone do not ring loud enough (with a few expectations)....Uniden does allow you to set the base station to ring, and it does ring loudly (too loudly at night) but that defeats the reason to have a cordless phone if you are attached to the base station all day. The LCD on the closed clamshell isn't very good. It is easier to read when the backlighting is off then when on. The hinge on my phone squeaked when opening and closing and the keys on the handset feel cheap, not what you should expect from at $250 phone. The software to program the phone is nice, easy to use, and made it really convenient to program in over 50 names and reminder dates, but it would have been nice if Uniden would have allowed you to download ringtones into the phone via the software and USB cable, rather then having to record it into the phone via a mic or a line setup. The color screen is nice and bright, but too small...its like 150 pixels X 150 pixels and the images you can download for your contacts become the size of a postage stamp CUT IN HALF! !Overall it is an average phone, not worth $250, maybe $160....all I know is mine is going back to the store for a refund. See you next time Uniden. Just gotten this phone with an extra handset for only few days and so far, I've been somewhat pleased with the performance. The system has a wealth of features, yet relatively easy to setup & operate. The main highlight is the cell phone-like function & design with Bluetooth technology. The sound quality on both ends is loud and clear. My Motorola HS850 bluetooth headset links up without a hitch. However, its shortcomings are the buttons on the handset which feels too plastic, and the LCD on the front side of the handset is difficult to read, even more so when lit. A friend had commented that the handset's LCD screen is small and OS software looks primitive. He also added that the handset's plastic housing doesn't have a solid feel to it. By the way, when opening/closing the handset, the hinge squeaks. For that price, one expects higher quality materials used and have good, solid construction. Also a concern is the battery charge/life. So far, I noticed that a charge yields about the same as your typical cell phone, lasting 3 to 4 days - relatively short for a cordless phone. All said, I have until the end of the month to put it thru a thorough test before having the option of returning it. UPDATE - Had the phone for a week now... and it's going back to the store. Guess it didn't make it to the end of the month. Too expensive of a phone system that has too many shortcomings. I'll hold off for a 2nd generation. This should have been be a 2-star rating (maybe 3-star), but definitely not a 5-star. 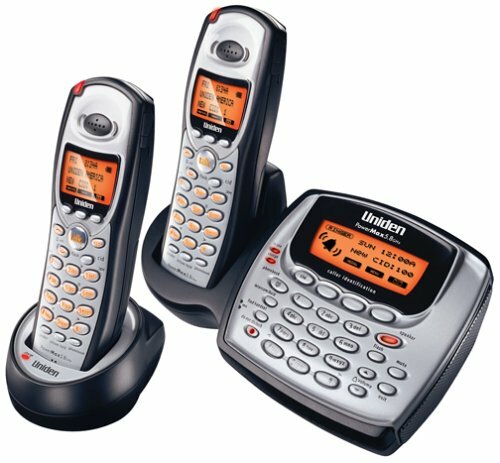 Since I rarely make calls from my home phone, I got rid of my land line and my Panasonic 2.4Ghz expandable phone system (total 5 handsets). To simplify my life even further, I am using my Cell phone as my home phone. With all the free weekend and nights minutes, I really don't need any land line phone. However, there are times when someone calls me and my cell phone is not around me, say upstair in the bedroom, and I am downstair. This is the time where I missed the cordless handsets the most, because I used to have them in every room. I read about this Uniden phone back in January, and found it is probably what I need, so I pre-order it last month. It was finally available last Thursday and I received it today with an extra handset just to try it out. I am not disappointed! This is a very well designed phone system. The menu is intuitive and easy to use, plus all the lights are my favorite blue :-). The handset is just like a clamshell motorola cellphone, even the icons in the menu. Probably a 256-color LCD, but it is a first for a cordless phone! Wallpaper and ringtone and even individual phonebook entry are configurable. You can even customize the handset from your PC using the included software and USB cable. It even has some PDA feature like calendar and appointment reminder in the handset. If I don't tell you, you might think I am talking about a new cellphone from Uniden. Besides the very functional handset, and of course, you can plug a regular phone wire and use it as a regular expandable phone system with ansering machine. But the feature that attracted me buying this phone system is the bluetooth connection. I was wondering why no one has thought about this when bluetooth made popular a couple of years ago. I paired my Sony Ericsson S710i to the base unit, just like one will do with the cellphone to the headset, it found the device and paired it with no problem. I set the base unit to connect to S710i automatically, and viola! Just so happen my friend called me on my cellphone, all 2 handsets were ringing (so did the S710i). 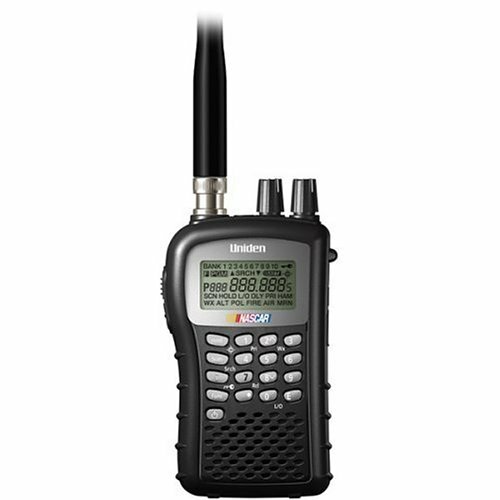 I pressed the "mobile" button, and pressed "Enter" to confirmed using S710i, and I was answering using the Uniden's headset. It even display caller ID on all the LCDs! Basically, my S710i is now my phone jack, and the whole Uniden system is plugged into it "wirelessly". Cordless + Wireless, what a wonderful solution! Bluetooth cell phone is getting very popular recently, even the stubborn Samsung is making new phone with bluetooth capability. If you have a land line and a bluetooth-enabled cellphone, you could now switch between the regular phone line and your free cellphone minutes at will. Talking about the convenience of answering both using just one handset(and you can tell which one is ringing by the different ringtone you assigned them)! The only thing on my wishlist for this phone is to be able to transfer phonebook from my cell phone to it via bluetooth. Since most bluetooth devices have this function, I can see a firmware update coming for this already great phone. 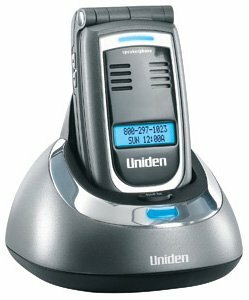 The Uniden TRU8888 cordless phone system offers an attractive bundle of features with room to grow. A 5.8 GHz digital signal offers increased call clarity and security, while the built-in digital answering system and caller ID capabilities ensure that you won't miss important calls. Housed in a sleek, modern-looking silver and black case, the single-line TRU8888 is ideal for small offices or busy households. It offers an impressive memory capacity shared between it's caller ID log and programmable memory dialing--100 names and numbers in the handset and 100 more in the base unit. You can (thankfully) search for numbers using a alphabetic search tool similar to those found on most cell phones, and the most commonly dialed numbers can be assigned to one of the 10 programmable speed dial locations accessed on the base unit. Saved numbers can be transferred among handsets. The TRU8888 features a traditional corded handset on the base unit and one cordless handset to get you started. The system requires just one phone jack for operation, no matter how many optional handsets (Uniden model #TCX800) you add--simply plug the base unit into a phone jack, and the additional handset will configure themselves to talk directly with the base unit. A total of ten handsets can be supported, including the corded one on the base. The TRU8888 base unit houses a digital answering system with remote operation. It has the somewhat unusual ability to record phone conversations, so beware of restrictions in your jurisdiction. Additional features include a full four-line LCD on the base with message counter, an audible new-message alert tone, and message waiting indicators found on each supplemental handset's charging cradle. 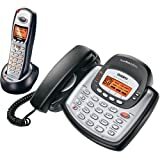 The phone has base and handset speakerphones, conferencing, trilingual menu display options, distinctive ring tones, mute, hold, redial, and headset compatibility (headset sold separately). You can transfer calls between handsets, use the handsets as walkie-talkies, and even use them as an intercom around the house or as a room monitoring system (baby monitor). All the phone you can ever need!!! I purchased this phone system at a local store and now I am getting some extra handsets. This is a remarkable phone system! Absolutely the best one I have ever purchased in my life. I do not want to live without the do not disturb function, which mutes the answering machine but records your incoming messages without the phone ringing. I work at night and now I can get some peaceful sleep in the morning without being interupted before I get up. Too many features to list, just make sure you read the manual thoroughly to get them most use of all the features and set it up to you preferences. If you need a multi handset phone this one is a gem! Love the amber colored keypad buttons too. I just keep telling my friends how great my new phone is, now I want to tell everyone to get one. Best phone system I have ever used! 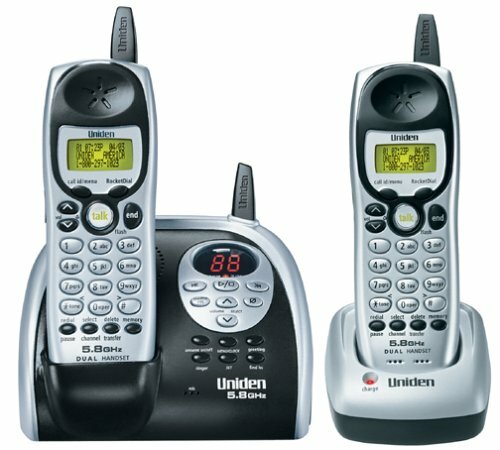 I got the Uniden DCX640 system with extra handsets and I love it! A 2.4 GHz digital phone from Uniden, the DCT 646 is multi-user expandable and comes with a number of useful features, including a second handset and extra charging cradle. Sleek and stylish, it supports up to two optional handsets (total of four). The phone utilizes the 2.4 GHz frequency and digital technology for clearer, more intelligible reception than traditional 900 MHz phones. An autoscan features automatically detects the best channel available. Caller ID/call waiting compatible, the DCT 646 has 100 programmable caller ID memory locations. A memory location transfer feature lets uses synchronize the memory locations of their handsets. An auto-talk function allows you to answer calls simply by removing the phone from its cradle, while the display-and-dial feature lets you easily scroll through the list of calls and dial with the touch of a button. A voicemail indicator lets you know when you have received messages. Twenty different distinctive ring options are provided, while handset and ringer volume controls allow you to easily adjust the phone's settings to your liking. A page button on the base makes finding a lost handset quick and painless, and the menu-driven handset LCD makes operation easy. Three-way conferencing is available between two handsets and an outside call, while the call transfer feature lets you route incoming calls to a different handset. A redial button lets you easily dial one of the last three outgoing numbers. Both tone and pulse dialing modes are provided in case you need to switch to one or the other. Wall-mountable, the DCT 646 is headset compatible and comes with a belt clip for hands-free operation. It also comes backed with a one-year warranty on both parts and labor. - works great for Caller ID AND actually works for Call Waiting! I've been through through probably around 5 or 6 different 2.4GHz phones, ranging from $30 all the way up to $110, only to return them back to the store in favor of my old 900MHz phone. I don't run a wireless system through my house, yet all the previous phones had static all through the house to some extent, or those that sounded good at close range to the base but were horrid at more than 20 ft. After buying this phone the other day for $78.98, I just feel in love with it. I've been looking for a nice 2.4GHz phones with one that did not require a phone jack due to lack of one in one of the rooms I often. So far, the only problem I've had with this is the fact that it is a bit small and I like to hold the phone against my shoulder, but that is more than easily taken care of by the speaker which is a big help. Another downside to the speaker system is that when you talk with the speaker on, the phone automatically turns off the receive so you can't hear them as you speak. I would recommend this to anyone with it's wide verity of options, it is a phone to last for years. My greatest concern when buying this phone was the clarity of voice. I was not disappointed. Voices seem clear and natural and loud enough to present no problems whatsoever. There is no static on either the main phone or handset number 2. I was delighted to find that after hammering in some twenty names and phone numbers into the main phone that all this data, as well as the time/date, transferred easily into handset number two. The 20 ring choices give plenty of interesting rings and music from which to select. The phone is small and light, much like a cell phone, which makes it easy to hold for long calls. The display and keypad light up with a very bright orange illumination which makes calling and moving about within the menu quite a breeze. So I don't sound like a shill, I have tried to find something about the phone I do not like, but so far I have not come up with anything. I highly recommend this system, and the Amazon price is about the lowest I've seen. Worth every dollar. Now that I have experimented with the phone for several days, I like it even more. I can walk a block away from my house and still maintain a clear contact with my party. I have added new names and phone numbers to the phonebook and can easily send these changes to the second handset. Initially I sent all the numbers and names to the second handset. What a time saver!! The speaker phone works fine, though I rarely use this feature. Voices come across loud and clear but a bit hollow, but I have found this to be the case with most speaker phones. There are many features I shall probably never use--such as the walkie-talkie option, voice mail, etc. Still not a dribble of static. This is one hell of a great phone system for the money. I shall now cast my two Panasonic phones (with a mere 10 memory phone book) into the outer darkness. A Cordless Phone System That Actually Works!! We have gone through many cordless phones in our house, and each one has had its own weaknesses. We have owned this system (base unit plus four phones) for a couple of weeks now and I have not heard any static or noise at all. Everything is very clear. The system has some very useful functions. For example, you can take two of the phones to the mall or amusement park and use them like walkie-talkies. You can also page between handsets if you want to talk to someone in the other room. I used this the other day when I got out of the shower and I need my wife to bring me a towel from the laundry room! I didn't think I would use that feature, but it came in handy! My wife complained just a little that the handsets are very small. She likes to hold the handset on her shoulder to keep both hands free. I explained that she could use a headset if she really wants to, but she thinks that would be too complicated. Anyway, this system works very well and is the first cordless phone system we've owned without any problems. I have always wondered why Cordless phones had to be so big. 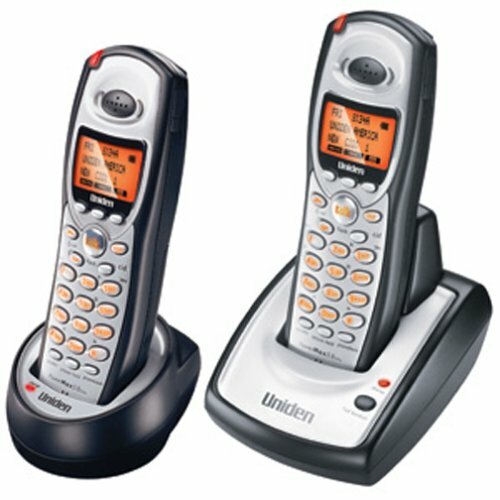 Finally Uniden came out with this new line of Cordless flip phones. I don't know why...but I seem to buy 1 new cordless phone per year. So, I feel I'm a bit of an expert on nearly every upscale 5.8 phone on the market having tried nearly all of them. 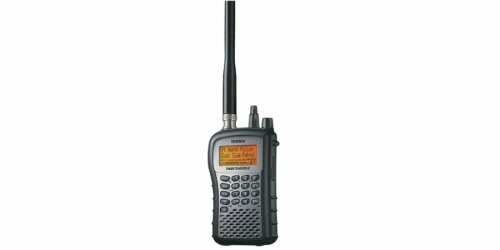 The best thing about this Uniden, and a big surprise to me is the GREAT sound on both receiving and talking. My brother actually told my my Uniden sounds BETTER than my corded phone. The range is very good as well. My only slight criticisim is you can hear YOURSELF a bit too much in the earpiece. I do like to hear a little of my own voice in the earpiece but in my opinion Uniden messed this part up slightly. However I owned the top of the line AT&T and V TECH 5.8 phones. On those you can't hear yourself AT ALL, thru the earpiece. To me THAT was very disconcerting and I felt disconnected while speaking on these phones. As far as a FUN/feature rich phone I can see no phone being better than this Uniden. It even has little animated animals showing you time duration of phone call etc. I LOVE the downloadable ringer faeture. You can record 20 seconds of GOOD quality sound...and make it your ringer. For me just for fun...I have a Favorite Beatle song as my ringer. You can also assign different ringers to different callers....very useful. Another nice feature is you can upload your favorite pictures to this phone and use them for the background wallpaper. I can go on and on...but it's ALL good news with this phone. I don't think any cordless phone can top this phone now or in the near future. As a side note, Amazon.com is a great place to buy this product! 24 hours after placing my order this phone went on sale at Amazon. A quick note to Amazon... they adjusted my price down to the new lower price...with a very considerate letter from Cus Service. I'm a big fan of Amazon...! Twenty distinctive ringer options are provided, and a visual voice mail indicator on the base lets you know when you have message waiting. 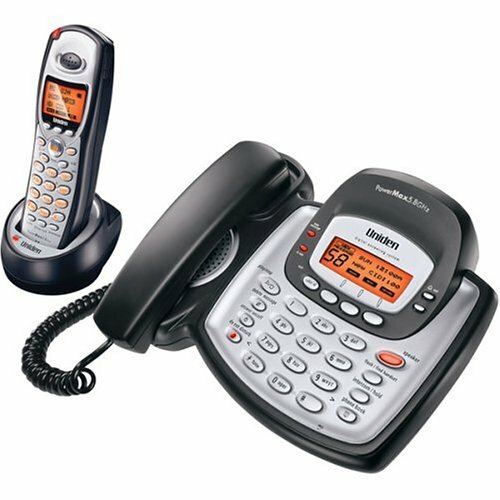 Wall mountable, the DCT 648-2 also comes with both a handset and base speakerphone. It is backed by a one-year warranty on both parts and labor. Nice phone but sound problem! While talking, my callers do not hear me clearly. Sometimes, I can hear my own voice coming back! I bought this along with two extra handsets while visiting my parents. My parents had two 900 mhz phones and one answering machine that picked up after four rings. By the time my mom got around to answering the phone she had to shut the annoying answering machine off. I upgraded their answering machine and phones and with this 2.4 ghz system along with two extra handsets. Now they've got a phone in each bedroom as well as one in the kitchen. I managed to set everything up the morning I left (after the minimum required initial 15 hour charge time). The answering machine picks up after 6 rings and each handset has been programmed to answer after picking it up from the charger (stopping the answering machine). I really like the speaker phone feature in each of the handsets too. The handsets are quite small but are all fully functional with caller ID. BTW you only need one phone line and four electrical outlets for each handset and answering machine. A SOLID HOME RUN !! This phone makes the sometimes frustrating search for a good cordless phone easy. Look no further! I can't find anything wrong with this phone. Uniden really seems to have thought of everything here. Not too much. Not too little. Just right! A soon-to-be classic cordless. Well done, Uniden. Sound issues detract from an otherwise great phone! * Different ringers can be assigned to a phone number in the directory, so when that particular person calls that melody or ringer will sound. * I was frequently getting a tinny sound coming from the handset. Also was hearing my voice in earpiece on the handset which is quite annoying. * In the speakerphone mode on the handset the sound is constantly getting low then comes back. Uniden seems to have done their homework when designing their new 2.4GHz phones, but the issues with the handset and speakerphone detract from an otherwise excellent phone in my opinion. Other Uniden phones that I've tested in the past have never had the issue with the tinny sound. I'm not sure if this tinny sound and the problems with the fading sound from the handset speaker phone are some how related. I originally thought that extra noise in my home office were causing the handset speakerphone fading, but when I went into another room that was quiet it still faded. I then thought that maybe the handset I was using was bad but I checked the other two the system came with and they also faded when using the speakerphone. Whether or not you can live with these shortcomings is up to the individual, but obviously sound is the most important aspect of a phone. If a phone cannot deliver good sound then all of the other extra's it comes with are pretty much useless. 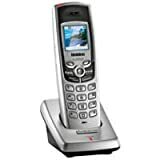 A 5.8 GHz analog cordless phone from Uniden, the EXI 5160 comes with a number of useful features and provides both a high-quality signal and reliable operation. Stylish and affordable, the EXI 5160 is a good choice for those uninterested in extraneous bells and whistles. By utilizing the less cluttered 5.8 GHz frequency, the EXI 51601 is able to offer clearer, more intelligible reception than traditional phones operating on crowded 900 MHz or 2.4 GHz bands. An autoscan features automatically detects the channel with the least interference. Caller ID/call waiting compatible, the EXI 5160 can store up to 30 numbers in the caller ID memory, while the display-and-dial feature lets you easily scroll through the list of calls and dial with the touch of a button. Up to 10 memory locations are available for the most frequently dialed numbers, and a RocketDial feature allows you to dial the most important number simply by pressing the RocketDial button. Each memory location supports up to 20 digits for numbers which require chain dialing. Handset and ringer volume controls allow you to easily adjust the phone's settings to your liking. A page button on the base makes finding a lost handset quick and painless, while the menu-driven handset LCD makes operation easy. The auto-talk function lets you answer calls simply by removing the phone from its cradle. A 32 digit redial button lets you easily call the last outgoing number, while both tone and pulse dialing modes are provided in case you need to switch to one or the other. Wall-mountable, the EXI 5160 is headset compatible and comes with a belt clip for hands-free operation. It also comes backed with a one-year warranty on both parts and labor. ~10-name/number memory for personal contacts, which can be scrolled through by pressing the Memory button, then using the volume Up/Down buttons. Charging battery for first time requires 15-20 hrs. NOTE: Memory dialing can store up to 15 characters and 20 digits per entry, which means any of the "10-10" numbers can be easily programmed in. If you need to store more than 10 personal contacts or looking for a lot of bells and whistles, this phone isn't for you. But if you want an extremely clear, no-nonsense cordless that excels at communication performance, comfort and battery life, the 5160 may be what you're looking for. Please keep in mind that cordless phones can perform quite differently depending on the area where you live, interference from outside sources, base placement, etc. My observations are based on my particular conditions and location. I paid $65 at Target, but watch for deals during the holidays. I noticed in our Sunday paper today that Best Buy has the 5160 for $59.99, so plan to head back to Target and do a little price shopping....get a few more bucks back. We tried out a Panasonic 2.4GHz phone before this one, and it had range and static problems too. This phone is quite clear within about 40-50 feet of the base, but in our house this doesn't take you far. Get beyond that range, and you might be able to find a position in which to hold the phone that it's not staticky, but if you move a couple inches, you get static again. Another nit: the memory dial only stores 20 digits, which isn't enough to program an MCI calling card, for example. We're going to try the AT&T 5830 next, and we'll see how that works. Phone has very poor range. Phone works well for me with one exception. I am disabled and have to keep the phone with me at all times. The buttons are super-sensitive to touch. I usually carry it with me and have to be extremely careful how I hold it.